Dollars Hunt | Welcome to DollarsHunt | Best Ways to make money online Free! Welcome to DollarsHunt | Best Ways to make money online Free! 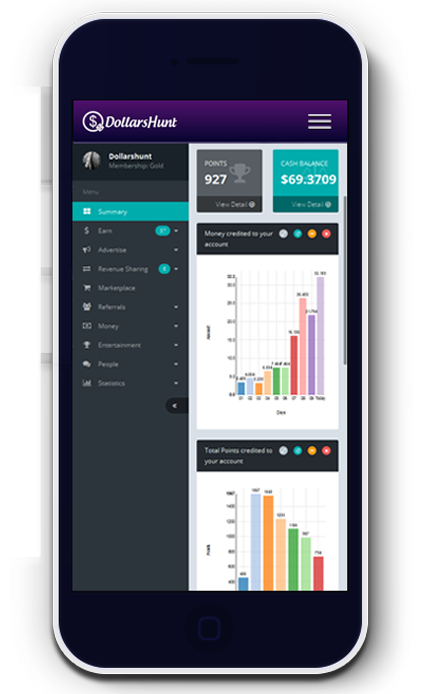 Earn money from completing free paid surveys and daily surveys, offer wall, clicking ads, watching videos, referring new members to DollarsHunt.com and earn from their activity, visiting websites, offerwalls and many more ways. Lets earn together! Don't be shy. Completely without any cost & skills! We offer our members high payouts on surveys and walls. We pay our members daily using Paypal, Payza, Bank Transfer, Skrill and Amazon. Our Contests offers members a chance to earn rewards for their work during contest period. Earn Amazing rates on all offers. The only GPT site you need for highest earnings. Refer other members/friends/colleagues and earn from their activity for lifetime. Get a VIP membership and earn a % extra on all offers in that period. Network: Kamelya1210 from Estonia has just completed the offer PTCWall worth 0.006 points!! Network: greatcash from Indonesia has just completed the offer Minute Staff worth 0.06 points!! Network: lakki27689 from India has just completed the offer Revenue Wall worth $0.504!! Network: memo2099 from Egypt has just joined "DollarsHunt Family" and earned "$0.10" Signup Bonus. Thanks for joining us!! Network: lakki27689 from India has just completed the offer Peanut Labs worth 30.24 points!! Network: ryan55 from United States has just joined "DollarsHunt Family" and earned "$0.10" Signup Bonus. Thanks for joining us!! Network: Kamelya1210 from Estonia has just completed the offer PTCWall worth 0.012 points!! Network: CHERRY from India has just completed the offer Peanut Labs worth 30.24 points!! Network: greatcash from Indonesia has just completed the offer Minute Staff worth 0.3 points!! Network: porfido54 from United States has just completed the offer OfferToro worth 11 points!! Network: khunt2 from India has just completed the offer Revenue Square Wall worth 45 points!! Network: greatcash from Indonesia has just completed the offer Minute Staff worth 0.18 points!! Network: jcambello from Argentina has just completed the offer MyAdWall worth $0.0001!! Network: jcambello from Argentina has just completed the offer ClixWall worth $0.0001!! Network: greatcash from Indonesia has just completed the offer Minute Staff worth 1.8 points!! Network: PunithaNisha from India has just completed the offer ClixWall worth $0.0001!! Network: Kamelya1210 from Estonia has just completed the offer Minute Staff worth 0.06 points!! Network: PunithaNisha from India has just completed the offer PTCWall worth 0.012 points!! Network: poldi66 from Germany has just completed the offer Revenue Wall worth $2.64!! © 2016 - 2019 Dollars Hunt. All Rights Reserved.